London: The public ballot for tickets to Professor Stephen Hawking's thanksgiving service opened on Saturday with visitors from the future welcome to apply. 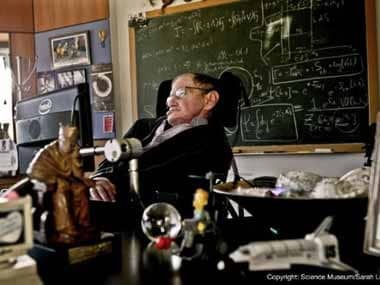 The theoretical physicist who captured the imagination of millions around the world died on 14 March at the age of 76. His ashes are being interred on 15 June at London's Westminster Abbey, by the graves of fellow scientific giants Isaac Newton and Charles Darwin. The world-renowned cosmologist's three children Robert, Lucy and Tim are offering up to 1,000 free tickets to the public through a ballot system, run by the Stephen Hawking Foundation. Applicants need to give their birth date - but eagle-eyed fans of the man who dedicated his life's work to unravel the mysteries of the universe spotted that it can be any day up to 31 December, 2038. London travel blogger IanVisits was among those who noticed the quirk that allows people born more than 20 years into the future to apply. "Professor Hawking once threw a party for time travellers, to see if any would turn up if he posted the invite after the party," he wrote. "Look out for time travellers at the abbey." Potential applicants - from the future or otherwise - are forewarned not to apply if they cannot arrange their own transport and any necessary visas.